In the early 60s, long before the hippies had the idea, my father customized a Volkswagen mini-bus. I remember him spending months working every night in the garage building its interior. He built a seating and table system that converted into a bed for him and mom. He rebuilt the front seat so the top part flipped up and made bunk beds for my brother and I. Over the engine compartment, he made a crib for my littlest sister, and, to either side of it, small bunks for my other two sisters. Being an aerospace engineer, he wired the whole thing up for sound and built a converter that transformed the car’s battery power into household AC. He did this 20 years before the RV craze and he did it all himself. The people who know “HOW” will always have jobs. The people who know “WHY” will always be their bosses. I don’t know if it’s still syndicated these days, but there used to be a television game show called, “Let’s Make a Deal.” It was a typically silly game show. Most notably so because people from the audience would wear the most outlandish costumes to try and lure the host into picking them out as contestants. If they were selected, the host would give them some kind of gift or money. Now, once a contestant had something to bargain with, the host would offer them a deal. In essence, he would say, “How would you like to trade what you have in your hand for what is behind door number 2?” (or box number 4, and so forth). The dilemma for contestants was that they knew what was in their hand, but they couldn’t be sure of what was behind the door (even though it was teasingly described for them). On the one hand, they knew that much bigger prizes lay in store for them if they decided to trade. On the other hand, “a bird in the hand is worth two in the bush.” Many times, someone lost out on a brand new car because they elected to hang on to two or three hundred dollars. I have been telling you all this because I want to use this game as a way to explore something with you. I want you to imagine that you are a Let’s Make a Deal contestant and I will give you some choices to trade between. 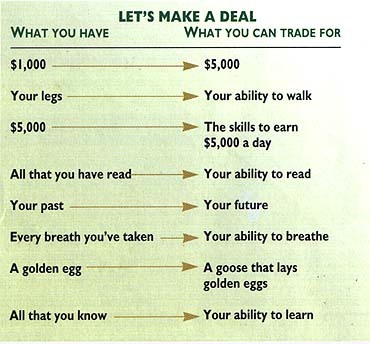 The left-hand column will be what you start out with, the right-hand column, what you can trade for. Each deal is separate. Circle your choices. Remember the title of this article? The Most Important Subject? What do you think it is? Take a minute – THINK – I’ll wait. Time’s up. From my perspective, “the most important subject” is… YOU! From your perspective, the three letters I-A-M work even better. Try saying it to yourself: I am the most important subject. Remember your last choice? You chose your ability to learn over all that you know. Somehow, it was obvious to you that “all that you know” is limited, and that “your ability to learn” is, comparatively, unlimited. SMALL JUMP… If you think back over your experience in school, would you say that your teachers were more concerned with helping you understand and improve your ability to learn, or more concerned with “the subject” that you were learning about? Wonder why? Our educational system, with the exception of exceptional teachers, hasn’t caught up yet. For generations, it’s purpose was to produce “knowers” — people who knew things and knew how to do things. But, the world has changed, and it is continuing to change so fast that the only sustainable advantage any individual can have is his or her on-going ability to learn. Education will catch up with this, but probably not until after you graduate. It’s up to you! Frankly, in my opinion, really understanding the implications of this choice to your education, your career, and to your life — and beginning to live and learn as if you mean it — is the most empowering thing you can ever do for yourself. If you do choose it, then learning to continually improve your ability to learn is something that you must do. But, you can’t do it by learning about someone else’s ability to learn, or about some model about how the “average person” learns. You have to learn about your ability to learn, and you have to do it for yourself. When you become your most important subject — when improving your ability to learn becomes the most important subject within you, then everything else you learn will be enhanced. You probably don’t remember learning to walk, but, maybe you do recall learning to swim or ride a bike. When you learned these things, you didn’t learn them by reading, nor did thinking about them make you able to do them. You learned in a deeper way. When you learned to walk, you really learned to “sense yourself” falling. Once you could sense when you were going to fall, learning to walk got easier, and you walked. The first thing you learned about swimming was to “sense yourself” starting to sink. Once you could sense when you were about to sink, learning to swim got easier, and you swam. Riding a bike was virtually the same thing as walking, except you had to also keep up a minimum forward speed to keep yourself from falling. Learning to improve your ability to learn is much more like these experiences than it is like learning about math or science or literature. Though learning about math or science or literature or anything else, for that matter, can become the “swimming pool” or semnasium (I will tell you about that word later) in which you can learn to improve your ability to learn. The world is now changing so fast that the only advantage any individual can have is his or her on-going ability to learn. You have to learn to “sense yourself” learning. You have to learn to “sense yourself” when you begin to “sink” or “fall” out of learning. So, how do you learn to do this? I call the process SEMNASTICS. If you’re like most people, when you read the word “semnastics™” your flow stuttered. It probably just happened again. What I am getting at is this: Every time you are in the flow of learning and encounter something — a word, a term, a phrase, a picture, a video clip, someone’s body language or tone of voice — that you really don’t understand, your flow is interrupted. I call these interrupts or stutters meaning needs. What I am proposing to you is that nothing you can learn about can be as helpful to your ability to learn as learning to sense your own meaning needs. Your meaning needs govern your learning. While the essence of science is a good question, the essence of a good question is authentic uncertainty. Uncertainty is one kind of many kinds of meaning needs. Once you can tell which of your meaning needs are important, and which ones are less so, you will learn which ones to follow through on, and which ones to let go. When you begin to learn this, YOU start PARTICIPATING in your own learning process in a new way. When you begin to do this, you develop a kind of inner COMPASS that will help you learn better, no matter what you are learning about. SMALL JUMP…“SEM” is the root of the word semantics which means MEANING. “NASIUM” is something I borrowed from GYMNASIUM, which means an environment that you exercise in. So, I am saying, SEMNASIUM™ is an environment for sensing and exercising in meaning and, SEMNASTICS, like gymnastics, is the inner discipline of the exercise. I hope I have given you something to think about – maybe even helped you learn a little. As for me, I have enjoyed the opportunity to share with you some aspects of my life’s work. 1. What did the father do to the Volkswagon mini-bus? 2. What does the author of this article remember most about the van? 3. What is the most important subject? 4. In the author’s opinion, what is most important? 5. If the author had a Volkswagon bus, what word do you think he would put on it?